November is National Native American Heritage Month and special events are being held around the U.S. Here's general info about the month. Here's stories and educational material related to the month. Grand Canyon National Park will host events on Thursday, Nov 14, as described in the news release below. Pipe Springs National Monument, located near the Arizona/Utah border SE of St. George, will host a series of events including those listed below. See details here. Grand Canyon, Ariz. -- On, Thursday, November 14, Grand Canyon National Park will be celebrating National Native American Heritage Month with special presentations and demonstrations. Each year, November is recognized as National Native American Heritage Month. American Indians, Alaska Natives, and Native Hawaiians are a special part of the tapestry of our Nation's history. As keepers of a rich and ancient cultural heritage, Native Americans share with all of us the beauty of their art, power of their songs and grace of their people. Grand Canyon's Native American Heritage Month celebration includes a special presentation on a new publication American Indians and the Civil War published by Eastern National, American Indian Alaska Native Tourism Association, National Park Service and the Bureau of Indian Education. This 30 minute program will take place at 10:00 a.m. in the Shrine of the Ages. All are invited to attend the 7:00 p.m. evening program at Shrine of the Ages for an evening filled with cultural dancing and demonstrations. 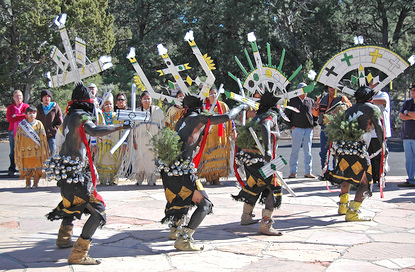 The Guardians of the Canyon Ram Dancers, Dishchii'bikoh Apache Crown Dancers, and the Hopi Warriors of Grand Canyon are scheduled to perform. Grand Canyon visitors and residents are invited to participate in this special day as we recognize and celebrate the many accomplishments, contributions, and sacrifices made by First Americans. To learn more about Grand Canyon's Native American Heritage Month celebration, please call the park's Diversity Program Coordinator Mariah Cisse at 928-638-7375, or Tina Yazzi, Vice-Chair of Grand Canyon's Diversity Council at 928-638-7761.